I’m the last of the 14 bloggers to choose my favorite Before and After project from One Project Closer’s Habitat for Humanity series (read about their AWESOME party and how it helps Habitat for Humanity HERE). I figured all the great projects would have been chosen by the time I got to choose, but I was o wrong! There were over 150 amazing projects linked up! I battled back and forth between my top five and finally decided that The Little Cottage on the Pond is my winner! 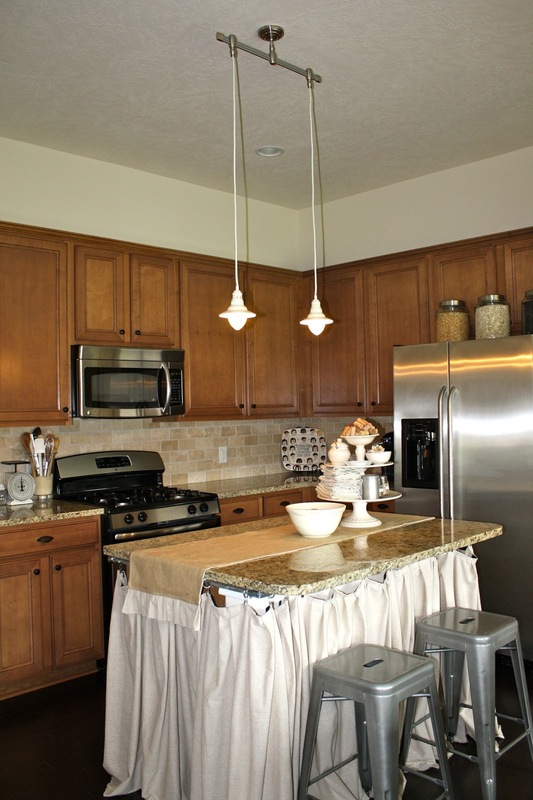 Tricia transformed her everyday kitchen into a beautiful neutral rustic kitchen. I love how she opened up cabinets and replaced the corner area with open shelving but still left plenty of regular cabinets to hide the unsightly kitchen necessities. The is the same as in the before photos but looks amazing with the new color scheme of creamy white walls, white upper cabinets and barely green lowers. And those bar stools, ugh I love them. I’m also loving all the white dishware that you can see displayed. The silver vase filled with wooden spoons adds another great layer of texture and practicality. Tricia added just the right amount of wooden antiques mixed with shiny stainless and fresh paint to create a great space with character and a fresh feel. I have personally salivated over these Martha Stewart pulls and handles from Home Depot. The perfect selection for this space. I love how her new kitchen design flows effortlessly into her adorable laundry room. So congrats Tricia! For more photos and details on this kitchen makeover, check out The Little Cottage on the Pond for a supply list including her Annie Sloan paint selections! That was the last $50 gift card for this year from One Project Closer, but there is still the $150 gift card to the readers favorite, so go check out all the amazing links HERE. And get your projects ready to enter next years contest! Thanks One Project Closer and The Better Half for inviting me to help! Thank you so much! I am flattered ; o ) The handy hubby and I have a blast doing these projects together.